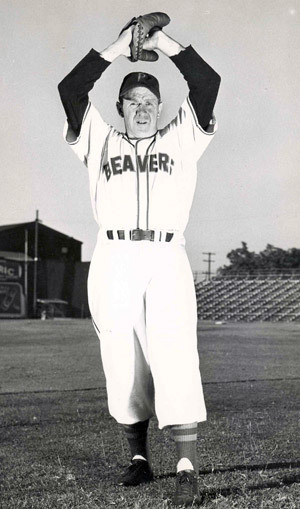 Roy Helser was a top pitcher with the Portland Beavers from 1942 to 1952 and was a member of Portland's 1945 Pacific Coast League pennant winning team. Later, Helser coached at Linfield College for 21 years, winning over 60 percent of his games (Wins 322, Losses 195, Ties 6). Helser's teams won 14 Northwest Conference championships and a National Association of Intercollegiate Athletics (NAIA) championship in 1966. It was the first national championship for Linfield in any sport. Helser was inducted into the Oregon Sports Hall of Fame in 1981. Roy H. Helser was born on August 27, 1911 in Portland, the son of Heinrich H. Helser and Katharina Helser who were born in Norka, Russia.